According to a Waterfront Toronto notice, reconstruction of the loop will move into Queens Quay proper on December 10 when work begins on the loop entrance (Section C below). Resumption of streetcar service is still planned for mid-February, 2014. 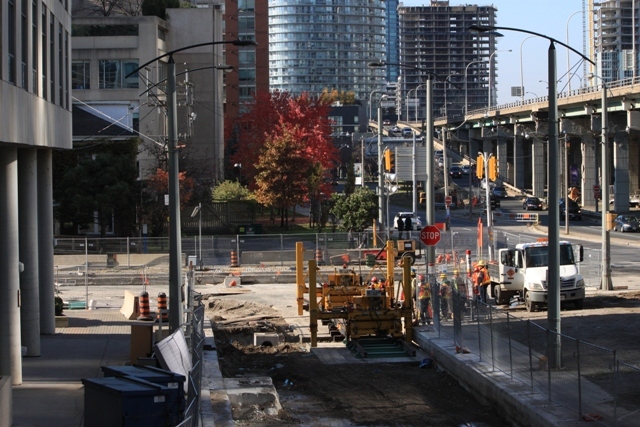 Construction of section “A”, the northwest quadrant, of Queens Quay loop continues. Looking southwest across the loop exit. Although several pieces are in roughly their final locations, they have not yet been assembled. Looking northeast, the reverse view of the one above. 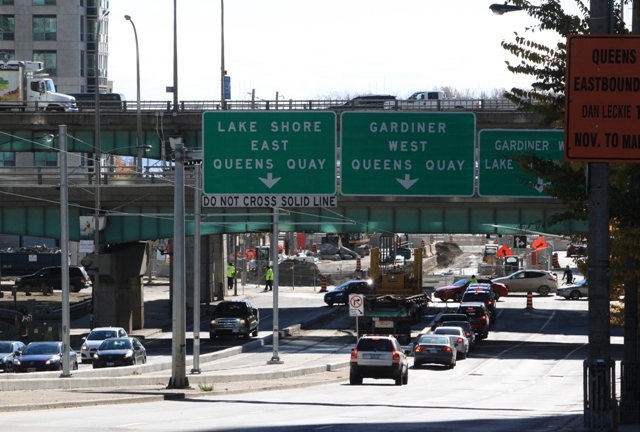 The intersection of Lake Shore and Spadina will be partially closed for the coming weekend to allow the portion of this quadrant extending into Lake Shore to be installed and connected to the new track on Spadina. The first panel of the new loop at Spadina and Queens Quay has been placed. Below is the switch at the exit from the loop. View looking west from the parking garage east of the loop. 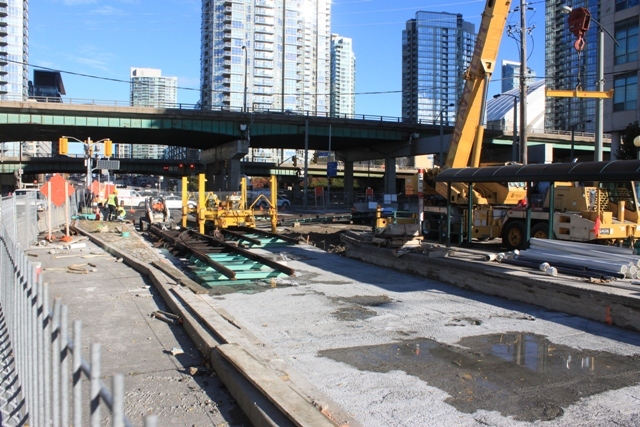 Also in progress appeared to be preparation of the roadbed on Spadina from this point southerly to receive the next pour of the foundation slab. Over the past weekend, the foundation slab was laid for the new track that will go in section “A” in the map below. The track will be installed on the following weekend over the coming week. Looking northeast across the exit from Queens Quay Loop. Looking south on Spadina from Bremner. A truck with one track panel for the new loop sits in the middle of the streetcar right-of-way. 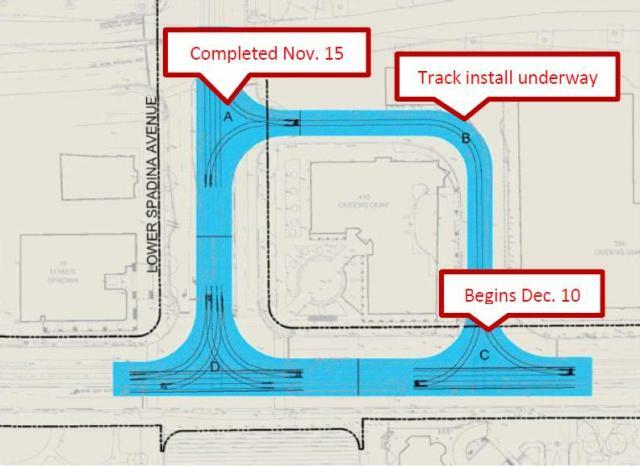 Waterfront Toronto’s construction notice for the week of October 28 advises that there will be a partial closure of the Spadina & Lake Shore intersection on the weekends of November 1-4 and 8-12 for track installation at Queens Quay Loop. 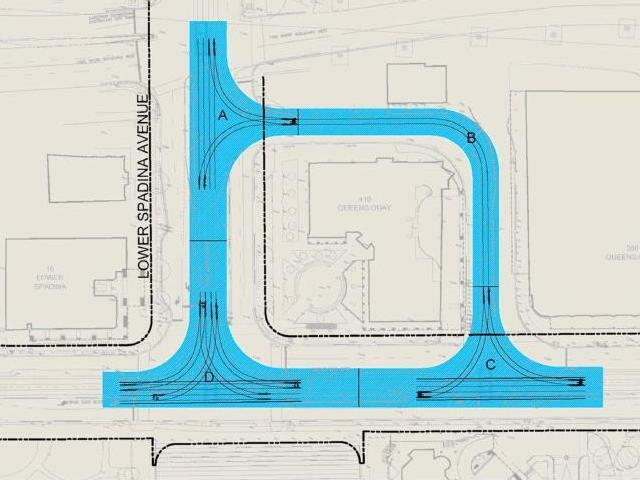 Waterfront Toronto has announced plans for the reconstruction of the loop at Spadina and Queens Quay and nearby roads. In a recent conversation and email, I clarified some aspects of this notice with James Roche, their Director of Parks, Design and Construction. The four month period cited in the notice runs through to the completion of work and re-opening of the loop for streetcar service in mid-February 2014. Work will begin on October 16 on the loop exit (section “A”) which includes part of the intersection with Lake Shore Boulevard. A partial closure of that intersection is expected in early November. Work on the loop track itself (section “B”) will proceed concurrently. The two sections on Queens Quay itself will be the next stages of work, and Waterfront Toronto hopes to be completed by the end of the year or early in January. This will give the TTC a month to erect the new overhead for the loop in preparation for service in February. 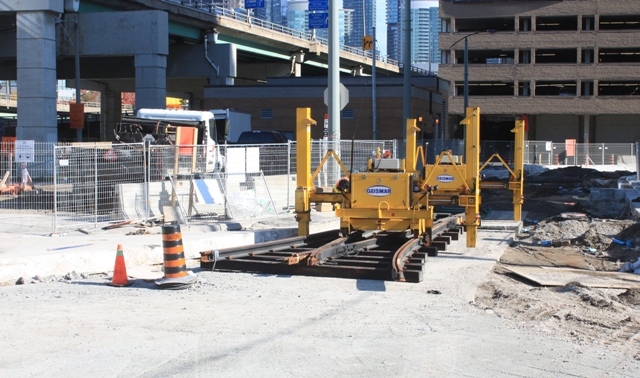 When construction resumes after the winter break, new track will be installed along Queens Quay east to the portal at Bay Street, and west (slightly realigned from its original location) to connect with the existing track at Yo-Yo Ma Lane. Hey Steve this may be early but do you have the service changes for November to December! I am hoping the 36 Finch W and the 42 Cummer get an increase on Saturday Afternoon, its always packed! Steve: No improvements are planned for either route. Given the fiasco that has been the 509 and 510 reconstructions, do we have any reason to believe that this project will finish on time? Steve: The delays on the current project can be traced mainly to Toronto Hydro starting work late. Some other delays were due to unexpected site conditions, but the big one was Hydro. They are just about done at Spadina and Queens Quay as far as interfering with the loop project (that’s why it hasn’t started until now), Tracl construction, as we know from other projects, goes quite quickly once the TTC has access to the site. In this case, because traffic access has to be maintained for everyone in the neighbourhood, there is a multi-stage process interleaving actual track construction with rearrangement of the road lanes to free up another chunk of work space. If they could completely close the site, the whole thing would probably be done in 3-4 weeks. I’m confused. Haven’t they been rebuilding this area for the last 3 years (or so)? And they’ve just come up with plans now? and there was a time when the TTC could replace a 5-way intersection in a single weekend. Steve: Work on Queens Quay started in mid 2012, not 3 years ago. The Spadina Loop was always to be rebuilt, but what has now been published are the detailed plans of how this will be done. As I have written before, the length of the work is a direct result of Waterfront Toronto’s agreement with all nearby businesses and residences to maintain access while the roads are torn up. This prevents a “big bang” approach such as that used at King/Spadina earlier this year. As for those weekend projects, they were possible when roads were not built out of concrete, and an entire intersection could be ripped apart overnight. Well, work is work. Let’s just hope there are no surprises. The problem with any work is that there can always a problem when after you start ripping things up. Some of the drawings of the area appear to have the streetcar travelling on the south side of Queens Quay adjacent to the sidewalk from just west of the Bay tunnel to just east of Bathurst. The confusing part is the track layed on the center of the bridge just east of Lower Spadina and at the loop, sections C and D appear to be replacing the tracks exactly where they are now in the middle of Queens Queue. Where will they be running the tracks adjacent to the south sidewalk? The tracks don’t move much, and in some cases not at all, but all of the road traffic is now north of the tracks. Steve: But they won’t be. The service is not scheduled to return until mid-February. I was in Zurich last week and there is a lot of track work going on. At one location they were replacing track while cars were still running, 4 line at a 7.5 minute headway each. There is a concrete base with Pandrol clips to hold the track in place. After the track is replaced they pour concrete to within 4 cm of the rail head then put asphalt on top. The rails have rubber liners on each side like Toronto and spacer bars. They don’t seemed to be worried about cracks in the top layer of concrete. There was one other section where they were doing a total replacement down the the sub-surface like Toronto. The cars were signed to the end of the line and everyone was thrown off were the construction started to transfer to many buses. 3 truck articulated with motorized 2 truck trailer, 3 truck articulated with motorized 3 truck trailer or a 5 section LFLRV. At least every second train is accessible so minimum headway for accessible vehicles is 15 minutes. All the low floor vehicles seemed to run very smoothly though sitting at the end of a Rotterdam car with long over hang would result in a quick jerk when the car started a turn. All the systems I have seen ran single ended cars, either exclusively or partially. The loops on most systems would handle 4 or more LFLRVs. Woodbine loop would be a small loop. Long Branch would be o.k. if they lengthened the spare track. Steve, the TTC has posted signs in union station indicating 509 STREETCAR service is to resume in March. Also the station itself is undergoing somewhat of an expansion. New parts to the mezzanine are being opened or about to be opened as of today. Steve: Thanks. I will have a look the next time I am at Union. Steve: Come off it! This isn’t “more”, it’s part of an ongoing and long-planned project as you know quite well. Ahhh memories. When the loop was built, I was the on site in charge Foreman. We had a forced deadline to finish and pave the track on the north side of the right of way at intersection ‘C’. We had a few hours on a Friday to do this as the neighbourhood was hosting a parade WB on the N side of the R o W. The parade included some elephants as part of the attraction. Where oh where was Bob Barker then? Steve, do you know if they are still planning a “big-bang” premiere of the LFLRVs on Spadina in the new year? I assume this won’t be ready in time for the loop to re-open? That would be a nice ‘thank-you’. Steve: The new cars won’t be in service until the fall, but the Queens Quay trackage is scheduled to open in July or August depending on who you talk to. The line will run with CLRVs pending availability of the new fleet in sufficient numbers if that’s how the timing works out. “The next phase of testing moves to Toronto streets and includes power, braking, coupling/towing, clearance, cameras, doors and much more before the streetcar can be commissioned for service, scheduled for the first quarter of 2014. Fall 2014 sounds quite reasonable to me as we still only have three prototypes but I can’t see where the TTC admits to this major slippage. Steve: I am in the process of getting a TTC clarification of the dates cited in various places. Is Bombardier behind schedule with these deliveries to the point where the TTC is entitled to penalty payments? Steve: No. Also penalty payments depend on stuff being the manufacturer’s fault. I’m puzzled why they tore up the entire intersection, since just the Queen’s Quay section needs to be realigned. Wasn’t Spadina Avenue all built with a base of concrete, then tracks on top? Steve: The track was due for replacement anyhow, and the new track construction is to a better standard than what was there before. The track south of King predates the new resilient track standard and was notorious for how noisy it was. 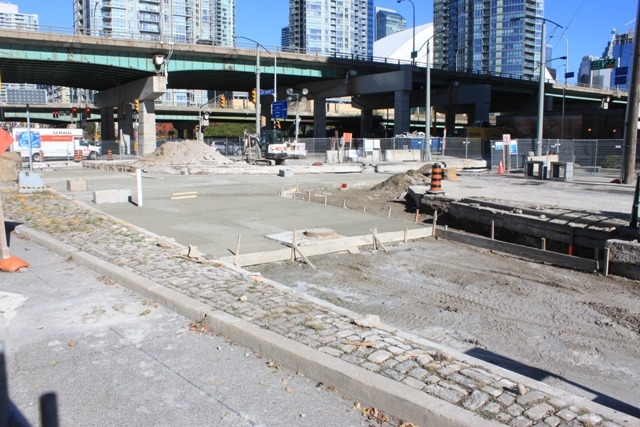 Just north of the Queens Quay loop, there has been new construction work going on at the Spadina/Front streetcar platforms. The concrete has been jackhammered away. Why? Is this more typical TTC “build it then destroy it then build it again” nonsense? Steve: This is part of the adjustment of the platforms to fit the height of the wheelchair ramps on the new streetcars. Remember that these platforms were built long before the TTC had specs for the new cars. Similar work was done on other parts of the route last year while it was closed. If the loop at Queen’s Quay is going to be finished in Feb. 2014 and if Queens Quay east of there will not be open until July of 2014, it is 2014 isn’t it’ has there been any thought to running the 510 cars to the exhibition like they did once before? Steve: Although the intersection at Queens Quay and Spadina will be finished, the track west from there to Yo-Yo Ma Lane (the western limit of the entire project) will not. 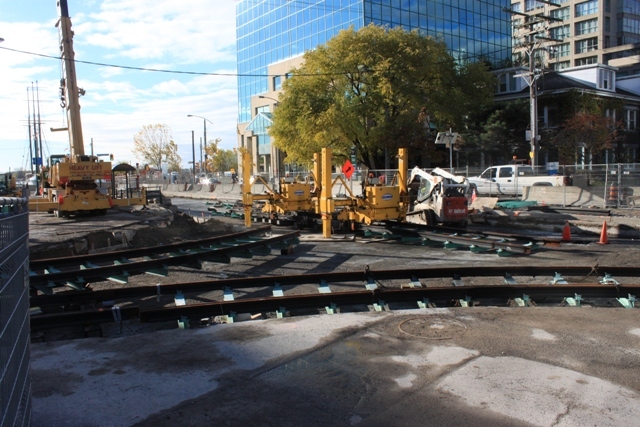 The road will be reconfigured so that the eastbound traffic crosses the streetcar tracks west of Spadina to join the new north side roadway, but that won’t be done until the first part of the 2014 construction season. Ergo no service to the CNE from Spadina. I’m looking forward to the completion of TTC track work and the eventual return of streetcars to Queens Quay West. This means a trip down to Harbourfront Centre and/or the Island Ferry Docks will require fewer transfers (to the “shuttle” buses that have been running on the “509 Harbourfront” route the past 16 months) and thus take less time. I’ve been taking the “511 Bathurst” streetcar and the “509 Harbourfront” buses to get down there since just before construction began. When are streetcars expected to return? Steve: To Spadina and Queens Quay, mid February 2014. To Union Station, late June. I was just walking past QQ and Spadina and there seems to have been little or no progress for the last 3-4 weeks. (As you note, Steve, segment A and the track south on Spadina towards QQ has track – though it still needs the top layer of concrete). No obvious movement on segments B, C & D. Ominously the TTC website makes no mention of work after November 12. There is also no overhead on Spadina south of King. I’m not a betting man but I would wager that this will not be completed in time to reopen in February 2014. Steve: I was by there a few days ago, and I thought that the base layer of concrete had been poured in the loop (segment B) and was under tarps curing. The real sign that things are on the move will be the shift of traffic to the south curb lane, a pre-requisite to building the special work for the intersection and the loop entrance. But, yes, this project is not exactly speeding along, and based on the weekly construction bulletins, the problem is still with Hydro running behind schedule, compounded now by cold weather. Re the top layer pour in segment A, I suspect that they are waiting until the rest of the job is in place to do this all as one pour. WT has just announced that they are about to start Segment C this week. They are still thinking it will all be completed (and reopened?) by mid-February. Steve: Yes, I saw that in the weekly construction notice, but had not reported it due to previous false starts in this area. The real question will be whether they will do the two sections on Queens Quay itself in one go and finish concreting the loop in total. A lot of that will depend on the weather. February? Maybe. There are still a few sections on the bridge over the rail corridor that need concrete too, although nothing really prevents streetcars from running there but the lack of overhead. On a vaguely-related issue (well, it’s still streetcar track construction): any idea why installation of the Cherry St loop has stalled? It was going great, but it looks like the crews just stopped one day and haven’t returned since. Steve: The area around the loop will be used as a bus parking lot for the Pan Am Games, and access is through the as yet uncompleted part of the loop. The work will not be finished until after the games. However, I believe that the north end of Cherry including the connection to King will be done in 2014, but am awaiting the detailed Capital Budget books to confirm the plans. Steve: That February date was dodgy and depended on good weather for construction, something we clearly are not having. The loop will be physically completed probably in January, but who knows when the TTC will get around to stringing the overhead. At this point, they seem to have decided not to schedule streetcars to Queens Quay until the third schedule period of 2014 rather than the second. I was down on Spadina and Queen’s Quay today and there is little if any sign of progress on laying rail on the loop since my last trip there in early December and no sign of any work on “Segment C” . I did see two TTC overhead trucks parked on Lower Spadina just north of Queen’s Quay so I suppose the overhead installation up to King may be starting. Steve: Yes. Despite the hopeful statements in Waterfront Toronto’s construction updates, little is actually happening. At least the overhead work has begun. The weather has not been helpful and, indeed, scheduling work like this through the winter is always chancy. For the past few years it has been mild. Not this year. Steve do you know what’s going on on the Spadina bridge over the railway corridor? The tracks are torn up *AGAIN* at two sections and work crews having been working for weeks now. This is a total fiasco. Any news about the Spadina bridge? Thanks. Steve: I saw work on progress there about a week ago, but don’t know the details. With the cold weather, things are proceeding very slowly. Next time I chat with the folks at Waterfront Toronto, I will ask about this and a few other oddities in the almost-complete project.